Ask most of us why we work here and “I love history” is sure to be one of the top three reasons. That goes double for Lauren Gray, an intern in the Palace of the Governors Photo Archives, former intern in the Fray Angélico Chávez History Library, and recent graduate of the University of New Mexico’s master’s program in U.S. history (with an emphasis in Colonial History and a secondary in Medieval and Early Modern Europe). Since January, Gray has been working as part of a three-year grant to digitize and preserve the photo collections. 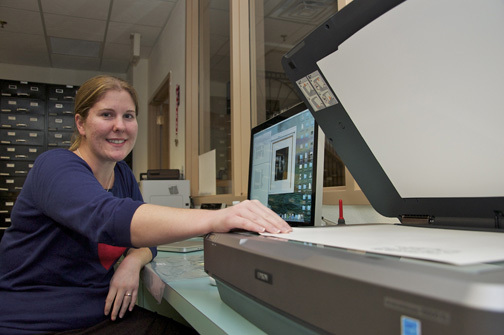 She has fastidiously and meticulously scanned and archived thousands of photographs, bringing an acute attention to detail, careful handling of fragile photographs and the ability to organize large amounts of data to the job. Her efforts play a very important role in bringing the Photo Archives into the digital age and allowing the public to view photos wherever they happen to be on planet Earth. Just how deep is her love for the History Museum? In September, Gray and her fiancée, Christian, were married in the Palace Courtyard. The couple shares a love of history and wanted to make a lifelong commitment there, Gray said, because of its long and diverse history and its beauty – a perfect fit for a happy marriage. 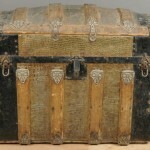 Almost everyone’s had a daydream about finding an old trunk in the attic, brushing off decades of dust, and opening it up to unknown treasures within. 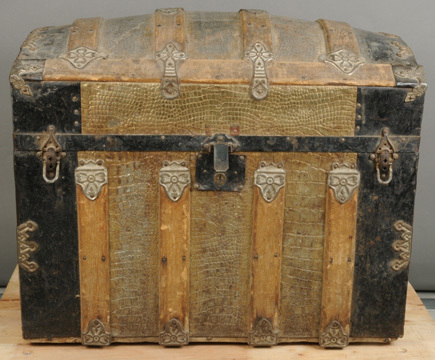 Minda Stockdale and Pennie McBride have gotten to indulge of bit of that fantasy with their work on an early 20th-century steamer trunk in the collections vault. Originally acquired by the Museum of International Folk Art in 1964 from the estate of Felipe Perea, it was recently accepted into the History Museum’s collections. 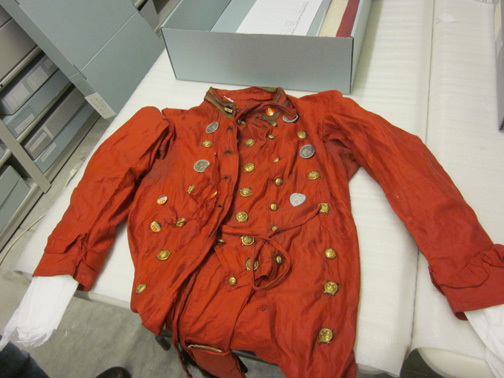 “It had been accessioned, but the items weren’t catalogued,” McBride said. “It was kind of a mystery project,” Stockdale said. The trunk itself is a beauty, with a roller top and adorned with mother-of-pearl and metal accents. But opening it and dealing with its many contents was a job McBride wasn’t sure she had time for. Then along came Stockdale. 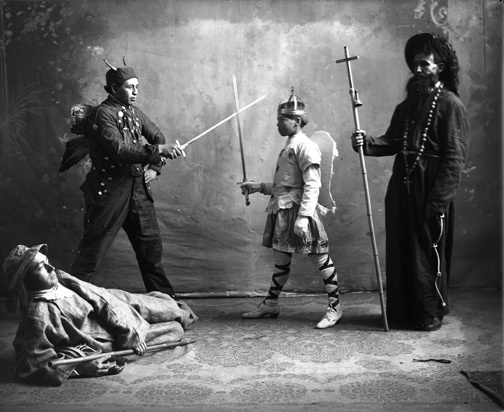 Stockdale (that’s her at left, holding the costume for the Boy Angel), a 2010 art-history graduate of Colorado College, had worked in a Park City art gallery, but missed the history part of her degree. The museum brought her on as an intern, one who wanted a project she could experience from start to finish. “It gives her experience cataloguing, inventorying, photographing, and rehousing, and she’s been doing a lot of research,” McBride said. The devil? Oh, that was just the start. 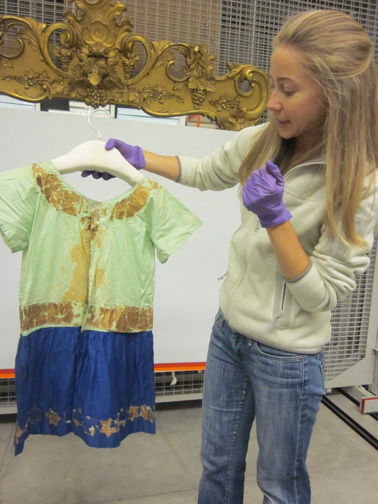 Since early July, Stockdale (who, yes, is the granddaughter of onetime vice-presidential candidate Admiral James Stockdale) has been coming to the museum three to five days a week to work with the trunk’s contents. Perea, the former owner, was an actor, and the costumes appear to have been used in a local production of Las Pastorelas (Shepherds’ Tales), a traditional Mexican play typically performed around the Christmas holiday. A 1915 photograph inside the trunk (see it at below) shows the actors dressed up, with Perea as the devil, Felipe Boen as the boy angel, and Frank Montoya as the hermit. A note written on the photo didn’t say who played the reclining shepherd. This was no ordinary devil’s costume. It’s festooned, folk art-style, with vintage Monopoly game pieces, silver medallions, an 1894 dog-tax tag and, for reasons Stockdale has yet to decipher, President Taft campaign buttons. The accompanying hat has goat horns, and the pants have metal bells sown down the sides of the legs. Props used by the actors included a comically large rosary and silver sheriff’s star, and a knife that turned out to be a real bayonet made for a 1903 Springfield rifle. “I’ve been e-mailing with Dr. Enrique Lamadrid at UNM because he’s been researching Las Pastorelas,” Stockdale said. While he’s been able to provide a lot of helpful information, she said, even he’s stumped by the connection to Taft, the president who signed New Mexico’s statehood bill in 1912. Also in the trunk were items for a ragtag circus, including a hand-painted banner and velvet shorts possibly worn by the strong-man actor. “I don’t know much about those items yet,” Stockdale said, but added that the task of finding out keeps her going. “I just get excited to come in every day and learn,” she said.